Sgt. Melvin Baney was headed for a new assignment in Europe. He had recently re-enlisted and was promoted with a new assignment. He was slowly moving up in ranks as a career military man. It could have been a happy time, a time of new adventures, new employment, new lands and a new start, but it wasn’t a happy time for he or his wife or their children. Melvin could not imagine how he could look for suitable off-base housing in a foreign country with a wife and five small children in tow. Marjorie felt strongly that they should all travel to the new assignment as a family. She and Melvin had lived in Germany before so it was not entirely new. It was just a gut feeling. Like a premonition. They should wait and all go together. Melvin and Marjorie were at a deadlock and it was downhill from there. Both were certain about the right thing to do. Sgt. Baney never returned. Flight 923 was forced to ditch in the raging North Atlantic, some 500 miles off the west coast of Ireland. His body was never recovered. Marjorie was devastated that he went against her wishes and internal anguish. Soon after she had the first of a long series of nervous breakdowns. It would be the start of her fall into a lifetime of severe mental illness. “Hope continued to fade today for a Pelham serviceman and 15 others still missing following the crash of the Flying Tiger Line Super-Constellation that went down in the Atlantic Sunday night. “Still missing at sea is Staff Sgt. Melvin H. Baney, a Korean War veteran who was enroute to a duty assignment in Europe. Unlike some of the military personnel aboard the ill-fated aircraft, Baney had left his wife and children behind. Only recently, within the past two or three years, have the children seriously begun an attempt to piece together information about their father and the ditching of Flight 923. Oldest son Jim Baney was only six years old at the time of the disaster. He had an older sister, Linda, who was 7, and two twin brothers, Michael and Timothy, both age 3, and a newborn brother, Eugene. They had all grown up knowing almost nothing about their father or his death. “The Baney family was living on an army base in Missouri. Jim doesn’t know which base, but remembers that the housing on the base was newly built when they first arrived– there was not yet grass in the back yard, it was all mud. And there was a ball field at the end of the neighborhood. He is not sure how long they lived there, but it was at least a year. “Melvin received orders to transfer to Germany, after a one month furlough. “During this time, James remembers a terrible fight between his parents on a normal afternoon. They were discussing the trip to Germany. It was a heated argument unlike anything he had witnessed between his parents. “There was yelling, punctuated by angry shoving of furniture. Jim and his sister hid in the bathroom. Their parents had never fought in front of the children before. 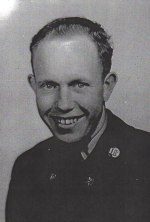 “Afterwards, Jim’s mother told him that Melvin wanted to fly out alone, ahead of the family to find a suitable place for them to live instead of the standard living quarters for families. Marjorie was insistent that he wait and that they all fly out together. Jim says his mom was subject to gut feelings and premonitions and she was furious that he would go unnecessarily against her wishes – she just did not feel good about it. “Marjorie bought a small house in Hudson, NH (the town next to Pelham), apparently using the proceeds of a small insurance policy and what meager savings they might have had. She did the best she could to raise them, but Marjorie never came to terms with Melvin’s death. “As time went on she began to show more serious signs of mental issues and irrational behavior, and had three nervous breakdowns over the following 3-4 years. She worried about neighbors climbing trees and looking in the windows. During these times, the children were temporarily split up among relatives; returning home when she had stabilized. “Jim remembers that his mom tried her best to raise the kids in a normal way, but her illogical behavior was at times confusing, frightening and sad for five children. Throughout her life, Jim recalls her constant references to her “woman’s intuition,” “clairvoyance” and “premonitions.” And while Jim felt these things were symptomatic of her mental illness, he recalls just as many times when the things she predicted or warned of, came true. “As the kids grew into adults, they eagerly left home to get away from the mental and emotional abuse that Marjorie’s mental illness brought. The younger children kept in contact with her until her death, although the children have gone their separate ways and have little contact with each other. “Sadly, in her last decade, Jim attempted to visit his mother but his resemblance to his father was too upsetting for his mother and so he chose to spare her the anguish. She had distanced herself from her family and people in general. “Unfortunately, with the loss of Melvin affecting Marjorie in such a dramatic way, the children also lost their heritage. Marjorie inadvertently isolated her children from the outside world – from outside family. Lost were the stories of who Melvin Baney was, since Marjorie avoided speaking of him. Thus, the children never knew anything about Melvin, about his family, his death – lost were the stories that let kids know where they came from. And somehow the children understood not to ask. “In the winter of 2008, during an ice storm, Jim received a phone call that his mother was in the hospital due to an internal abdominal rupture. She lived at that time in an assisted living duplex. “Marjorie told the EMTs that she opened her front door to find an alien. The alien thing shot her in the stomach with a ray gun and she fell backward into the foyer, where she laid for hours. She was on morphine when Jim arrived and unconscious. There was nothing they could do. [Editorial Note: There was virtually no press about Melvin Baney, the man, as was the case with most of the soldiers, especially those from less educated and poor families. There was a lot of competition for news space at the time: The Cuban Missile Crisis was coming to a head, the East Germans with Soviet aid began reinforcing their 866 mile long death zone barrier along the entire East German border. In that same week another military air craft crashed in the Pacific off the Alaskan coast, killing all 100 crew and military passengers. In the process of gathering documents, Jim and Joan came upon a report of the “incident” in Sgt. Baney’s personnel file. It was very typically military. It contained this interesting official notation. His records were adjusted to record his period of absence from duty. This entry was posted in passengers and tagged air crash, air disaster, Do the right thing, Melvin Baney. Bookmark the permalink. Isn’t it true? Every family has a story. Marjorie, a young mother with five little mouths to feed, and overnight – no husband, no income. What would any of us have done in the same situation? Melvin was my uncle, my mother Shirley, was Marjorie’s sister. I was only 2 when this tragedy occurred, so obviously I don’t remember any of the details. My mother and aunt Marjorie were very close, so my family spent a lot of time with the Baney family. I commend Joan and Jim for being so open in their narrative. In reading this article I got my first view of my uncle Red. Wow, Jim and Gene really look like him. Melvin, his wife Marjorie, and their first child (died at birth), are memorialized on the “Carter” headstone at Gibson Cemetery in Pelham, NH. Each Memorial Day, at Gibson Cemetery, in Pelham, NH, a Memorial Service organized by members of American Legion Post 100 and Veterans of Foreign Wars Post 10722, includes a reading of the names of deceased Pelham Veterans. At this time, Sergeant Melvin Baney, U.S. Army, Korean War, is among the list of names read each year. As a VFW Post 10722 member, and “Red’s” Brother-in-law, I am proud to be serve on the Memorial Rifle Squad….